There are management tools that have become ‘enshrined’ in organizations and many of the executives become settled on the ones they have bothered to learn or seemingly do the job.The problem we are having, many of the traditional tools, many still taught in most management schools are lagging the changing market we are operating in. Equally there is such a growing movement on adopting new tools, many still in that lovely excuse of “being in Beta” that it does become confusing. One of the consulting companies, Bain & Co has conducted the Bain’s Management Tools & Trends survey since 1993. The latest one for 2015 is here. They have made 15 surveys over the years and reported on the top 25 tools of each year. To be included they have to be relevant to senior management, topical and measurable. The intent of this survey is to track what is ‘trending’, under what circumstances is it being used and how satisfied managers are with the results. It also helps provide better choices in selecting, implementing and integrating the different tools so as to hopefully improve an organizations performance. Finally when Bain conducts this survey they gather the opinions on a range of business issues and report the changing management priorities. I have followed this for a number of years and yet I am constantly surprised how little this seems to have really changed or the tools used, yet we have such a groundswell of management tool makers or so we believe. If we want to get top management to change on their beloved tools I feel it might take a different generation to sweep away the old guard and bring in the new. One company pioneering a change in tools is Strategyzer founded by Alex Osterwalder of Business Model Canvas fame. They are working towards a Strategyzer’s Toolbox of useful Business Tools. They are positioning themselves on a mission to find the right remedy for designing future growth engines by wanting to fill that gap by creating a set of tools for business strategy, business design and innovation. Each one of them focuses on solving a specific business problem. I feel they have a long way to go but are certainly on a promising road. ’Business Tools’ are conceptual frameworks that are specifically designed to help business practitioners solve a concrete (and limited) business problem in a real-world context. The best tools are conceptually sound, simple, practical, visual, have a great user interface (UI) and provide a great user experience (UX). It is these characteristics that make them ‘fit’ for the real world and increases adoption by business practitioners. According to Strategyzer, Business Tools help strategists address today’s complex challenges in two ways: by providing a structured approach and a shared language. In Strategyzer’s view there is clearly a gap between the tools a company uses to execute a known business model and the tools they use to design future growth engines. Returning to Bain’s advice might help us work through the tool ‘desire and need’. As companies seek to grow and innovate in an era of rapid technological change, they offer the following four suggestions based on their research to help managers get the most out of the tools they choose. Adapt tools to your business system—not vice versa. 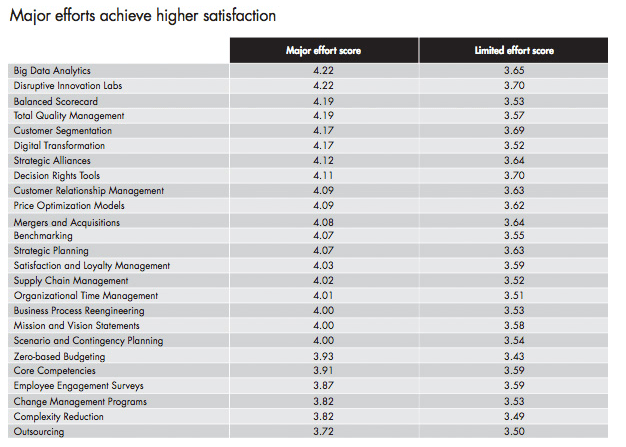 Bain’s research shows, for example, that major efforts achieve significantly better satisfaction scores than limited ones. 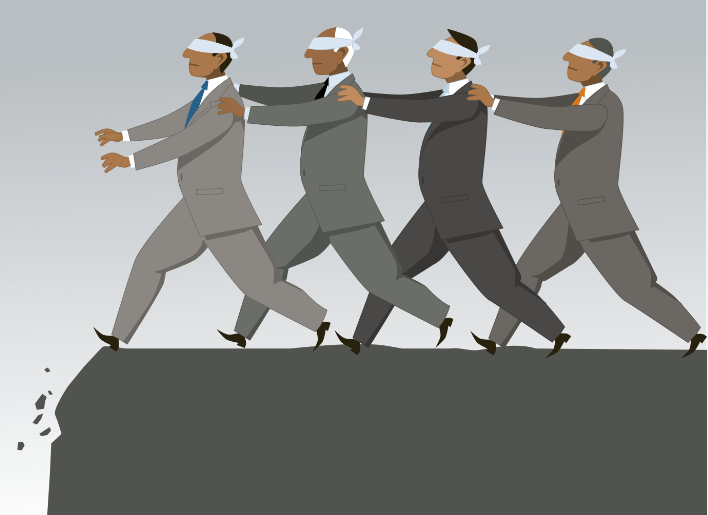 If management can only engage in a limited effort, it may be best to avoid using some tools. It’s also important to keep in mind that satisfaction scores for the same tool can vary widely depending on company size and region. Companies seem to be deploying a wide and ever-shifting array of management tools, to address business challenges and capture business opportunities. The number of adopted tools is partly determined by the organizations size, its needs and its abilities to really apply the tools and get these well used in their company. The size of the management effort is critical to determining tool satisfaction. The more they use the tool, give emphasis to it, the more it seems to give satisfaction in capturing and delivering on the tools’ design. Clearly the importance of implementing tools across the organization needs top-down support and consistent use. Presently the highest rated tool is Big Data Analytics; more than half of surveyed executives say that Advanced Analytics are transforming their marketing strategy. Complexity Management was not a highly used tool even though increasing complexity was identified as one of most pressing business challenges. In the above table you can see different tools vary in their level of satisfaction based on the level of effort put into their implementation. Big Data for instance scores a 4.22 in satisfaction from increased effort, and falls to 3.65 with limited effort. Innovation labs too show similar variation (4.22 vs. 3.70). Digital transformations have the potential to go very badly, with a score of 4.17 for highly active efforts and 3.52 for low effort operations. We also have to remember that the tools you select often have differences in their focus, is it more on revenue growth or cost cutting, on innovation or customer relationships for example. This may be one reason for the increasing popularity of Big Data Analytics at present, which is helping companies more effectively segment and target customers as currently companies are looking for greater growth. Established market firms continue to lean toward using more traditional tools such as Benchmarking, still the Balanced Scorecard and Employee Engagement Surveys are extensively used, even though these might come in different guises of simple to complex scorecards, dashboards or KPI initiatives, with lots of traffic lights and directional arrows ‘enhancing’ these. Finally one tool that is being put into place in APAC region that has for me a really high interest. On the 2015 list of Bain’s is Disruptive Innovation Labs. These foster disruptive innovations—high-risk, high-return breakthroughs that often start at the bottom of a market but eventually displace established competitors. So What do Disruptive Innovation Labs do? Disruptive innovations require different time frames, processes, performance metrics, people and skills than incremental (or “sustaining”) innovations. The evidence shows that Disruptive Innovation Labs work better when separated from core business operations. Primary benefits of separation include the ability to acquire and retain exceptional talent, work within specialized facilities, offer a higher level of Freedom to challenge conventional wisdom, look to reduced bureaucracy and increased flexibility and offer more entrepreneurial cultures and incentives to build the culture to seek disruption. Research also shows that Disruptive Innovation Labs benefit from “soft integration” methods, such as social integration of senior teams, job rotations, collaborative planning, shared knowledge networks, and cross-functional teams and task forces. These methods help to focus the lab’s efforts on real-world problems. They also reduce conflict, leverage existing assets and economies of scale, and encourage adoption and deployment of breakthroughs. Most management teams aspire to innovation “ambidexterity”—the ability to fully exploit existing assets while simultaneously exploring new capabilities required for future success. So how aware of this specific trend in disruptive labs were you? It is presently not trending very highly in Europe or North America and that must give many companies one or two alarm bells around innovation. It would me. So if you would like to explore more the Management tool and trends survey for 2015 by Bain’s and Co here is a further link. Tools and trends are certainly just piling up, have you established your toolkit yet? Time to take a deeper look at all that pile. This entry was posted in Uncategorized and tagged building better innovation tools, deeper innovation understanding, Defining deliverables for innovation, exporting knowledge and innovation, Innovation Structure, innovation toolkit, knowledge for innovation, sharing in innovation design, Tools and Methods for Innovation Management. Bookmark the permalink.